How many times have you decided to invest in a power tool only to eventually find out that it doesn’t meet your expectations and requirements? The answer is probably – many times. It’s an inevitable occurrence that troubles many people who decide to listen to their instinct or simply buy the first thing they stumble upon. In order to help you avoid such scenarios, we have covered some of the top-rated units on the market including the Milwaukee 6232-21 model. If you’re looking for a high-quality portable bandsaw with quite a bit of useful features, this particular one might be a good solution. Take a moment and check this review out, especially if you’re not sure who to trust and which brand to invest in. We tried to cover as many important points as possible so that you don’t have to wander around the Internet and look for answers in places that aren’t as trustworthy and reliable as one might expect. Portability and compactness are two main selling points of this particular model. 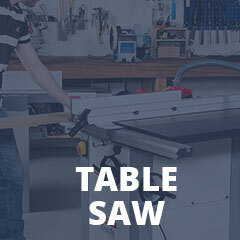 On top of that, it is capable of coping with a range of materials, but it’s mainly foreseen for cutting plastic tubes or smaller pieces of wood, depending on the blade you choose to install. The unit is also quite durable, well-designed, and it doesn’t require a lot of previous experience. In simpler terms, it’s a great choice both for professionals and occasional users. Milwaukee is a pretty well-known brand and they put a lot of effort into the design, reliability, and customer care. If you decide to go with this particular brand, you can count on good warranty conditions, reactive customer support, and most importantly – good quality. Many of these portable units are quite similar to each other. There are some notable differences, but the concept remains the same. The most important thing one should look for when it comes to the design is compactness. This model is lightweight, easy to use, and it stands out as one of the best ones on the market when it comes to one-handed operation. In other words, it can be utilized with only one hand meaning you have much more control over your work, safety, and speed. The edges of the chassis are protected with thick rubber shrouds. While it seems like a standard feature, it’s still worth mentioning because it shows how durable and resistant the Milwaukee 6232-21 is. In fact, it can withstand quite a beating thanks to these protective mechanisms and can be used on busy worksites. As we already mentioned, this particular model can be used for cutting metal, plastic, and wood. However, it’s foreseen mainly for plastic and metal because there are plenty of other models that cope with wood with more ease. Because this unit doesn’t feature more than one speed, the efficiency of cutting through various materials is significantly reduced. It does have a wheel that somewhat regulates the speed of the blade, but it’s far from a multi-speed unit. Therefore, even though it’s not impossible to cut a variety of materials, it’s recommended that you use it mostly for pieces made of either plastic or metal. The overall safety is at a reasonably acceptable level. The unit doesn’t feature an impressive amount of safety mechanisms, but there are more than enough to keep you as safe as possible, as long as you make sure to fulfill the conditions and prioritize protection over performance. Some people tend to bypass the integrated safety systems in order to get seemingly better performance, but it’s definitely not worth the risk. The first thing we noticed about this model is its simplicity. While some other ones can be quite complex and even cause confusion, this particular one is pretty straightforward. It doesn’t require too many adjustments out of the box, except for some fine-tuning of the blade. Other than that, all you have to do is plug it in and that’s it. The other significant advantage over its competitors is the price. While it’s definitely not a cheap piece of equipment, it can be considered affordable and budget-friendly due to its auxiliary features and professional performance. Whether you’re a DIYer or a professional, you’ll certainly find it useful and efficient. The blades are not included with the product. Now, this usually isn’t a big deal, but it can be quite a nuisance for people who are unaware. The blades are easy to find online, but it’s an additional step that many people are not willing to take, especially if they are looking for a plug-and-play model. Keep the lack of blades in mind if you’re planning on investing in this particular model because it can be an unpleasant surprise if you forget about it. As far as user impressions go, most people like this product. Some find it a bit noisy and unstable, but those are negligible factors. The main selling point of this bandsaw is the combination of simplistic design and high efficiency. It’s not something one should use for massive projects that require continuous operation, but it’s a neat power tool to have for different applications. If you’re looking for an all-around portable saw that doesn’t cost a fortune, take a moment and check this one out. It’s far from the best one available on the market, but on the other hand, it offers more than enough features for smooth operation and fine cuts. One thing that might bother you is the fact that some proprietary parts can be hard to get a hold of, but those occasions are quite rare. Devoted professionals might want to look for something with more versatility as far as the supported materials go, but hobbyists shouldn’t have too many issues with it. It doesn’t perform miracles, but it does its job quite well.